For a list of jurisdictional energy code adoptions in Texas, please click here. This code applies to commercial, industrial, and residential buildings over three stories. This code applies to residential (one- and two-family residences of three stories or less above grade) construction in Texas. As of November 17, 2016, the South-central Partnership for Energy Efficiency as a Resource (SPEER) reported that since the new residential energy code went into effect, 63 large cities and 19 smaller cities have adopted the code locally. SPEER also notes that 15 additional large cities have adoption ordinances in development. Legislative and Regulatory: The Texas State Energy Conservation Office (SECO) has authority over the adoption of building codes for state-funded buildings, and the Texas Legislature has control over the adoption of statewide energy codes. Adoption is not automatic upon publication of new code editions by ASHRAE or ICC. When new ICC codes are published, Energy Systems Laboratory (ESL), a division of Texas A&M University, has six months to compare the stringency of the current Texas Building Energy Performance Standards with newly published codes. Upon completion, ESL provides written recommendations to SECO based on analysis and public review. If ESL recommends adopting the new code, a stakeholder meeting is held to gain input and a draft of the new rule is published for public comment. All written comments submitted to SECO within 30 days are forwarded to ESL, which develops recommendations that SECO may ultimately accept, amend, or reject. After an internal determination in consultation with its legal division, SECO must issue a notification in the Texas Register of its intent to adopt a new or update energy code as well as a request public comments. The Texas Legislature still retains authority to adopt energy code policies itself by directing SECO to promulgate rules to that end. ESL has six months after the International Code Council publishes a new edition of the IECC and IRC to compare the stringency of the current Texas Building Energy Performance Standards with newly published codes. Upon completion, ESL provides a letter of review to SECO. HB 1736 is signed by the governor. This legislation updates the energy code for residential and commercial construction. Amendments raising the ERI scores for Texas homes decrease the overall efficiency of the code from the 2015 IRC Chapter 11. The 2009 IRC Chapter 11 becomes the effective energy code for single family residential construction. The Texas Energy Systems Laboratory (ESL) sends the State Energy Conservation Office (SECO) an official letter analyzing the 2012 IECC and the 2012 IRC Chapter 11. The ESL finds that the 2012 IECC codes are significantly more efficient than the 2009 IECC and IRC Chapter 11 adopted by the State of Texas for both residential and commercial buildings. With this letter, SECO begins a rulemaking process in 2012 to consider adopting the 2012 IECC. A report on building energy codes programs in Texas was featured in an article in the New York Times. The Houston Commercial Energy Conservation Code becomes effective. On August 3rd, the Houston City Council voted to approve adoption of the new code. This code adoption is in response to the State Energy Conservation Office requirement for Texas municipalities to update their minimum codes to meet or exceed the 2009 IECC. Local amendments will allow commercial projects or multi-family residential projects above three stories to demonstrate compliance with either the 2009 IECC or ASHRAE Standard 90.1-2007. The city’s residential energy code has been based on the 2006 IECC since January 2009. The 2009 IECC becomes effective commercial, industrial, and residential construction (with the exception of single family homes). The 2006 IECC was never adopted in Texas because SECO received a letter from ESL-Texas A&M (which was charged in the adoption bill by state legislators to provide technical support) about concern with the stringency of that version, when applied in Texas. This notice can also be found in the June 4, 2010 edition of the Texas Register. SECO issues a draft rule to update the state’s energy codes that is published in the Texas Register. The proposal would update the Texas Building Energy Performance Standards (currently based on the 2000 IECC with the 2001 Supplement) to the energy efficiency provisions (Chapter 11) of the 2009 International Residential Code (IRC) for single family homes, effective January 1, 2012, and the 2009 IECC for all other buildings, effective January 1, 2011. When using a prescriptive path for residential construction with a window to floor ratio or 15 percent or less, ESL recommends compliance with the 2009 IECC or Chapter 11 of the 2009 IRC, although it notes that there is a “marginal improvement in overall residential energy efficiency of the 2009 IECC over the energy provisions of the 2009 IRC.” For all other residential and commercial construction, ESL recommends compliance with the performance path of the 2009 IECC. A bill is introduced in the Texas State Legislature that would adopt the energy efficiency provisions of the 2009 IRC for single-family homes and the 2009 IECC for all other residential, commercial, and industrial construction, but this bill ultimately fails. The first statewide mandatory energy codes (see below) become effective. Texas adopts a mandatory statewide energy code – the Texas Building Energy Performance Standards (34 TAC §19.53) – based on the 2000 IECC including the 2001 supplement through Senate Bill 5 (SB 5). These standards apply to both commercial and residential construction. For residential construction, IC3, an original software program developed by Texas A&M University, may be used to show compliance. Local jurisdictions are allowed to adopt more stringent codes. For state-funded buildings, SECO adopts ASHRAE Standard 90.1-2004. Except for state-owned buildings, Texas had no mandatory statewide energy code before 1999 for either residential or commercial buildings. 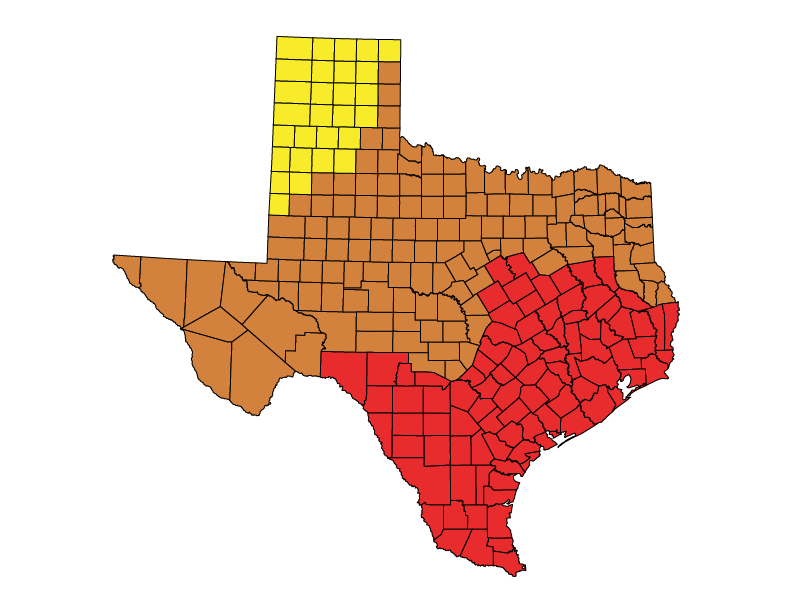 Texas is a home rule state, generally leaving the authority to adopt most policies to local jurisdictions. No attempt had been made to adopt mandatory energy codes on a statewide basis. At the time, the state simply encouraged voluntary code adoption and implementation by training code officials and homebuilders.